Explore higher dimensions of yoga in a breathtaking valley of Pokhara, Nepal with Rishikul Yogshala’s 300 Hour Yoga Teacher Training program. Take the next ideal step forward in your journey of yoga with advanced teachings and practice of the majestic art form. Accomplish yourself as an advanced yoga practitioner and teacher as you get to experience yoga in its purest and highly enhanced form. The meditative land of Nepal calls out all the 200 Hour Yoga Teachers to step ahead in their journey of yoga with 300 Hour Yoga Instructor Training In Nepal. If you have immersed in the yogic practices in India, perhaps, it is time to experience this majestic art form in the meditation capital, ‘Nepal’. Deliver yourself to a brand new experience of inner-transformation with advanced teachings and practices of traditional yoga styles with our 300 Hour Yoga program in Pokhara. The holy country of Nepal has its own unique place on the map. Eminent as the world’s best trekking destination with the highest and most dangerous trekking points, the country is quite eminent for its traditional history. The land is resplendent with ancient temples, pagodas, expressing its homage to the science of yoga and meditation. This is not all! 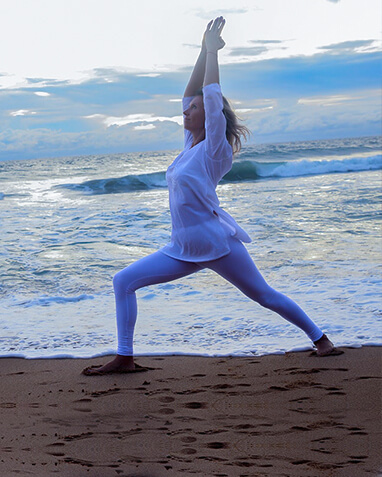 The country is home to some of the highly acclaimed and revered yoga and meditation gurus who hail to this blessed land for the holy purpose of enlightenment and solace. 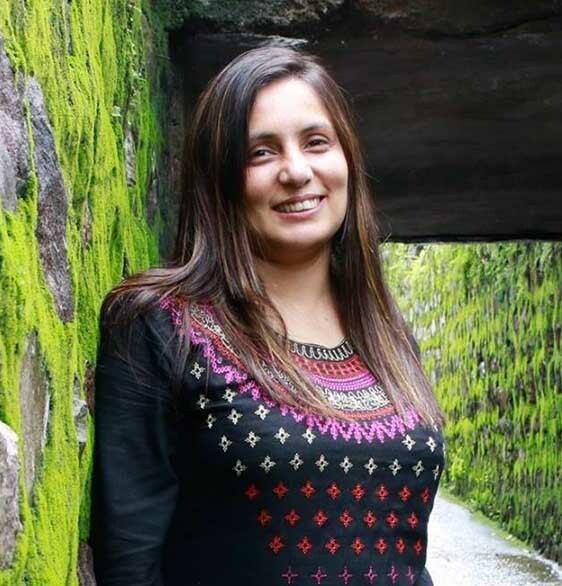 This land has become second home to several yoga gurus and teachers travelling from across the globe to dwell in its very lap. 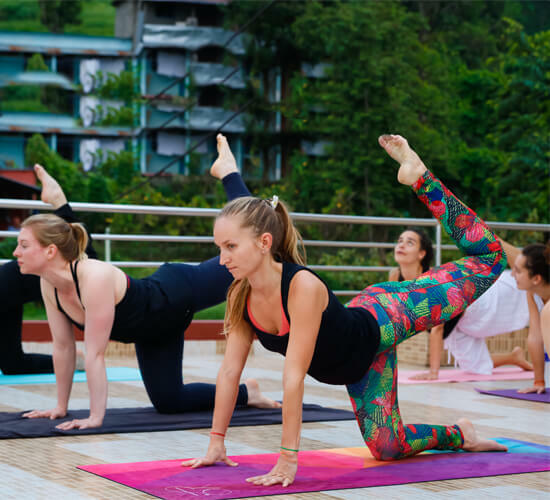 Immerse into refined yogic practices and evolve as an advanced level of yoga practitioner and yoga teacher with our 300 Hour Yoga program in Nepal. Come, explore divinity, wisdom and life in its most beautiful form here. Our 300 Hour Yoga TTC in Nepal marks the next progressive step towards evolution into a practiced yogi and teacher of the art. The aim of this program , is to take the participants onto a higher level of yogic journey with advanced teachings and practice of the most traditional forms of yoga. Travel to the global meditation and world’s highest trekking destination to unearth the treasures of yoga on a much advanced scale. 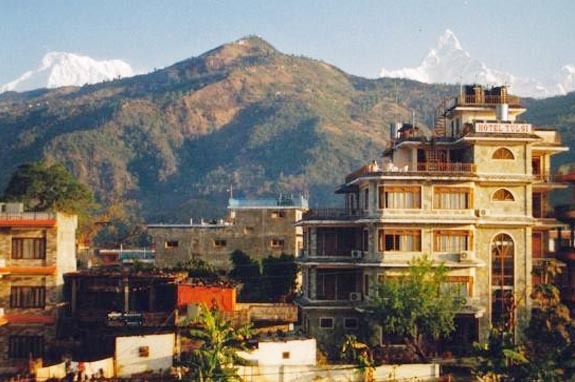 If you are a 200 Hour Yoga TTC graduate and are aspiring to immerse into more intense and sophisticated layers of the science then 300 Hour Yoga Teacher Training Course In Nepal is the ideal step to undertake. The program curriculum has been set in accordance with the guidelines and standards of Yoga Alliance which shall lead the practitioners to successfully practice and deliver the art form anywhere across the globe. 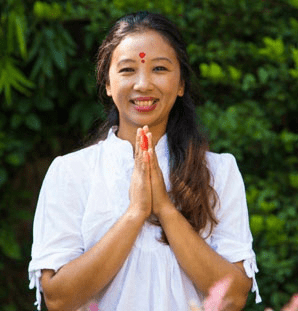 Those who have completed their 200 Hour yoga program at a beach side location would greatly relish undergoing their 300 Hour yoga certification in the snow-laden beauty of Nepal. Advanced teachings of Hatha and Ashtanga Yoga. Along with the learning and practice of 200-hour TTC, you shall be immersed in the detailed teachings of these two traditional forms for complete transformation as Yoga erudite and teacher. In-depth study of Yoga Philosophy with respect to ancient texts of Yoga Sutras of Patanjali, Bhagavad Gita, and Yoga Upanishads. 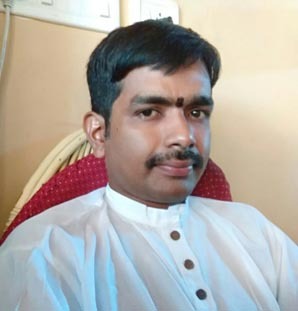 Practical application of Yamas and Niyamas on more consecrated and a disciplinary note shall be undertaken during this program to prepare your body, mind, and soul for living a yogic lifestyle. Higher, Deeper and Practical study of human body science and its relevance in yoga with the aim of performing the advanced yoga postures with finesse and extracting the maximum value from the program. In-depth immersion into the adjustment and alignment techniques in order to perform yoga postures with ease and without the risk of injury. Breath-based training with emphasis on deeper Pranayama techniques for the greater benefit of the body, mind, and soul. Learn the enhanced yogic techniques of meditation and Pranayama and commence on the path of internal -healing. Higher techniques of using advanced yoga props for practicing the intense yoga poses and for deep restoration purposes. Establishing a strong connection between the body, mind, and soul through advanced meditation practices such as Yoga Nidra. 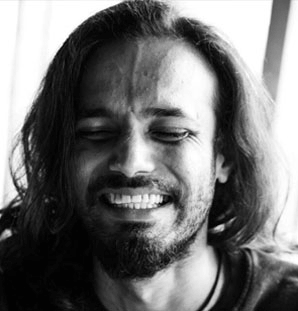 Understanding and practicing the advanced Shat-Kriya techniques, an intense purification method for an absolute cleansing of the body, mind, and spirit and making the practitioner ready for the higher level of Yoga and Meditation. 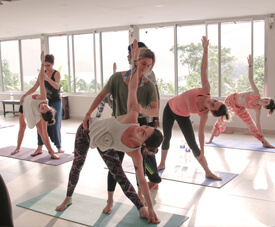 Dedicated workshops, seminars, group-discussions and self-practice classes for a comprehensive understanding of the whole curriculum studied in 200 hour YTTC and 300 hour YTTC. Make every use of the opportunity to gain first-hand experience in conducting yoga classes with veracity and professionalism during Teaching Methodology II. By this level, you would feel a complete transfiguration from a student to a skilled yogi. Experience absolute immersion in divinity and spiritual enlightenment during soulful Satsang sessions with us. 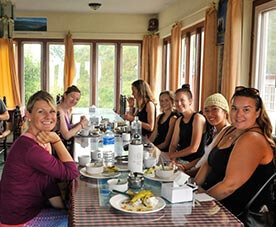 Learn to prepare the yogic meals in order to lead a healthy lifestyle forever during Ayurvedic cooking classes. 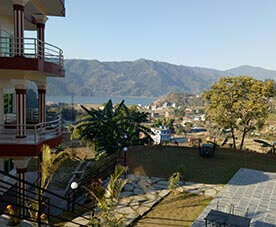 Excursions and various activities for relaxation and rejuvenation. Earn global recognition status of being a 300 Hour RYT endowed under Yoga Alliance upon successful completion of this program. 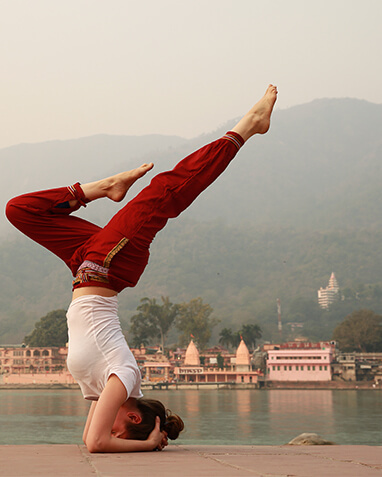 Being a Yoga Alliance certified school; Rishikul Yogshala has always ensured finest quality and standards in imparting the yogic wisdom and expertise. Upon graduation, our students can pursue their yogic life as an advanced yoga teacher with the liberty to practice and preach the art anywhere across the globe. Our 300 Hour Yoga Courses In Nepal offer you an opportunity to reside amidst snow-laden panorama outlined by sparkling river streams at our venue in Nepal. Become witness to breathtaking and highly meditative scenery instilled with peace that offers the perfect solace to our students where they may self-reflect or spend a cozy and quiet time during leisure hours. We offer clean, hygienic accommodation to each student that is also facilitated with all the much-needed contemporary amenities such as twin beds, TV, lights, water geyser, private washroom, etc. 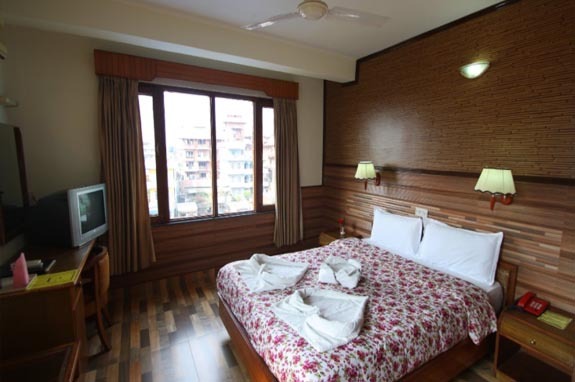 for a homely and comfortable stay at the hotel. 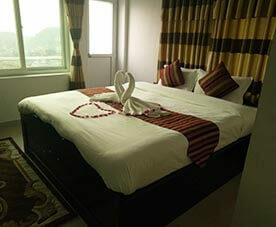 We offer rooms on sharing basis. 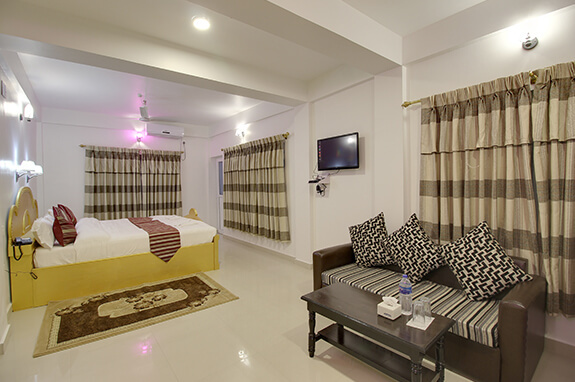 However, private rooms can also be availed on request. Relish the highly appetizing traditional delicacies of Nepal at our food facility. 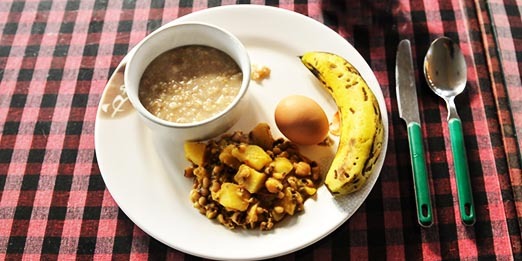 We offer home-cooked meals to our students for their mental and physical benefits. The food is served thrice a day with the inclusions of herbal drinks, salads, main-course, breads and accompainments, to our student’s delight and contentment. The meals are prepared from fresh produce and are completely organic in nature. Cooked to perfection in Ayurvedic recipes and herbs by our professional chefs, our aim is to ensure all our students are well fed with completely balanced and highly nutritious meals to successfully undergo the rigorous demands of the program. We serve 100% vegetarian food. Vegan meals choices can also be availed upon request. Yoga in the mountains at sunrise the next day. Phewa lake visit with the guide. Cleaning of Lakeside as a part of Karma Yoga. Planning of trekking activities to Annapurna range. Undergo complete mind, body transformation and evolve as a full-fledged yoga instructor and practitioner. 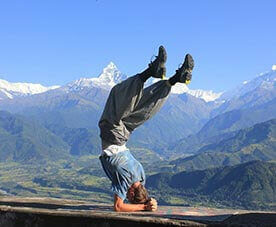 Acquired skills and knowledge of advanced layers of the traditional yoga forms such as Hatha, Ashtanga, Pranayama, etc. Get trained under the tutelage of highly evolved yoga teachers specializing in 300 Hour Yoga TTC programs. Extensive insight into the system and discipline of yoga as discussed in the yoga sutras of Patanjali. Get adapted to the yogic lifestyle and ethics while undergoing this program. Perform even the most complex yoga asanas with perfection and safety using various adjustment and alignment techniques, yoga props, etc. Acquire the art of healing as an enhanced and evolved yoga practitioner. 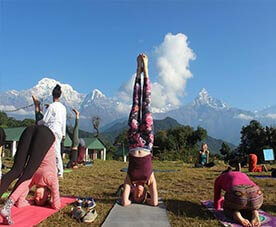 Heal and be healed during the 300 Hour Yoga Certification In Nepal. 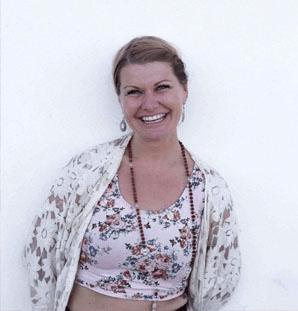 Get the opportunity to establish yourself on a global platform as an experienced yoga instructor and practitioner with the freedom to teach the art form anywhere across the globe.